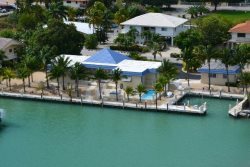 Come enjoy the Florida Keys like a local with a private tropical island & waterfront home! This newly furnished 2B/1B home is located on a quiet street in Marathon near mile marker 52 within walking distance of seafood restaurants and the Florida Keys Aquarium Encounters. This newly furnished, fully stocked vacation rental features all the amenities of home, such as flat screen T.V.s & cable, linens and towels, central A/C, WiFi, dishwasher, washer & dryer, plentiful parking space, stocked kitchen, propane BBQ grill and much more. This tropically styled home can sleep 6 (queen, full, & twin over full bunk and a fold out cot in the closet). And is proud to boast a brand new pool and hot tub in the back yard! The most exciting part, get ready to bask in the sunshine of your private island, Little Russell Key/Dolphin Jump Key, located a 1/2 mile offshore in Marathon and a 5 minute boat ride from the waterfront property. Our cottage features a basic non-stocked kitchenette, a small bunk house, bathhouse, picnic table, lounge chairs, and fire pit. 4 Kayaks & paddles are also supplied on the island for ocean adventures. This Florida location is frequented by a variety of wildlife including visiting dolphins, sea turtles, manatees, parrot and angel fish, roosting pelicans, lobsters, and great herons just to name a few - perfect for nature lovers, avid photographers and sport fishing enthusiasts. The exposed fossilized ancient reef is beautifully landscaped with trails wandering throughout the mangroves. Whether you're exploring the paths, admiring the vivid sunsets, fishing from the dock, or snorkeling in the crystal-clear waters around the island, we're sure that you'll find something to love about this vacation package! Hurricane Irma has set us back a bit but won't hold us down long. In 2020 we hope to have our " Little Private Island " back in " Ship Shape " for kids of all age's to come injoy. So STAY TUNED an in the mean time don't hesitate to check out our great little home on the mainland with a great private pool and instant access to fishing in the Gulf of Mexico.